for a variety of Professional Settings and Applications. is designed to provide educators, medical caregivers, counselors, therapists, artists, community organizers and those in related fields with experiential training in the expressive and creative arts. Participants learn to facilitate transformation, self- discovery and the evolution of consciousness when working with groups or individuals. The programs use a holistic, multi-modal approach to the Expressive and Creative arts, concentrating specifically with an integration of visual imagery with movement, sound, and expressive writing. Our innovative non-credit Professional Development program. 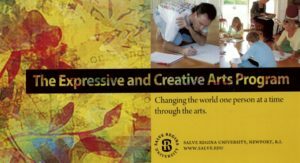 Certificate of Graduate Studies / Advanced Graduate Studies (CGS/CAGS) in the Expressive & Creative Arts as Transformation. to the Master’s degrees in Holistic Counseling or in Holistic Leadership or Rehabilitation Counseling. forming Salve Regina’s “Holistic Graduate Programs”, part of the department of Counseling, Leadership and Expressive Arts, bringing powerful learning experiences for a wide range of professions.